Wow, what an exciting (and busy) month this has been! First off, Carter FINALLY started crawling this month. What an answer of prayer! His personality is definitely starting to blossom even more, because he is perfectly content to still sit and play with toys instead of exploring this new found skill. Although, he is beginning to figure out he CAN follow us from room to room, he often gets sidetracked by a toy and plops himself down and plays. We will see what this month brings! 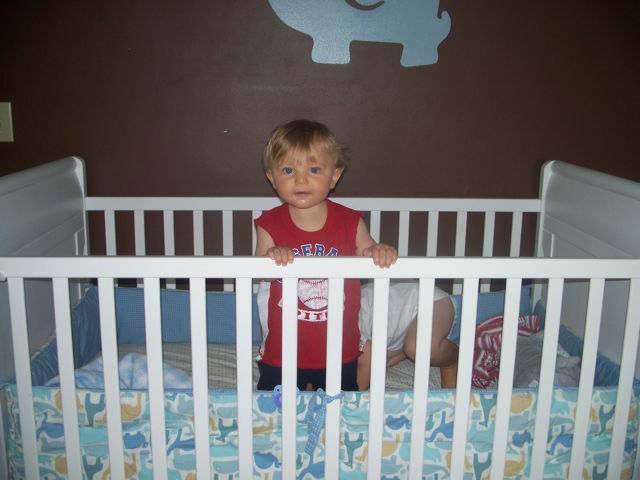 He is also starting to pull himself up in his crib and wants to stand all the time. He is understanding many words such as mommy, daddy, Evan, grandma, grandpa, Babci, Poppi, dog, cat, book, snack and many others. It is so amazing to watch the acquisition of language and how quickly it compounds. It seems that he is learning new words every day! He has decided that real food is much better than the pureed stuff. It is getting harder and harder to get him to eat anything pureed, even though he isn't eating enough "real food". He is also weening himself from bottles (formula), but sorry kid you have one more month of it! He is so cute drinking from his cup, almost like he is a real kid! He is obsessed with strawberries. He would be completely content on eating strawberry chunks for every meal. Silly kid! He definitley loves fruit and will gag every time I try to give him any chunks of veggies, even though he loves all the veggie purees. He has also realized that if and when he is finished eating that he can throw the rest of the chunks over board and he doesn't have to eat any more. Fortunatley, Victor cleans up that mess! His favorite thing right now are books. He gets so excited when Jeremy asks him if he wants to read a book. Jeremy insists that he says "book". I think probably he has, even though I haven't heard him. He can sit for long extended periods of time and just look and feel the books and listen to whoever is reading to him. Of course as a teacher, this makes my heart jump a beat! He also LOVES playing "Where is Carter?" He has been playing this game with us for months, but now he will initiate it and giggle and giggle! He will use his hands, a blanket, a toy anything he can find to cover himself up.He also has discovered that he can play this with himself in a mirror, which is the most hilarious thing to watch. No matter what he is doing, I can say "Where's Carter?" and he will find his mirror and get his face as close to it as possible and then touch his finger to the mirror. He's a genius, what can I say. Life, as I got used to it, has definitely changed. 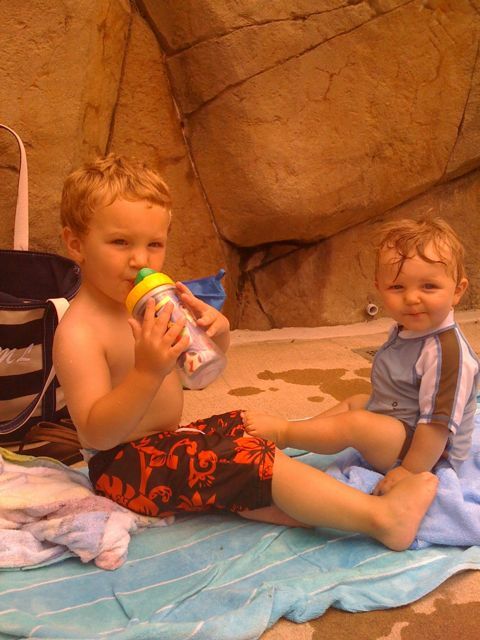 Fortunately, Evan is a WONDERFUL big brother and it is amazing to see how their relationship is growing. 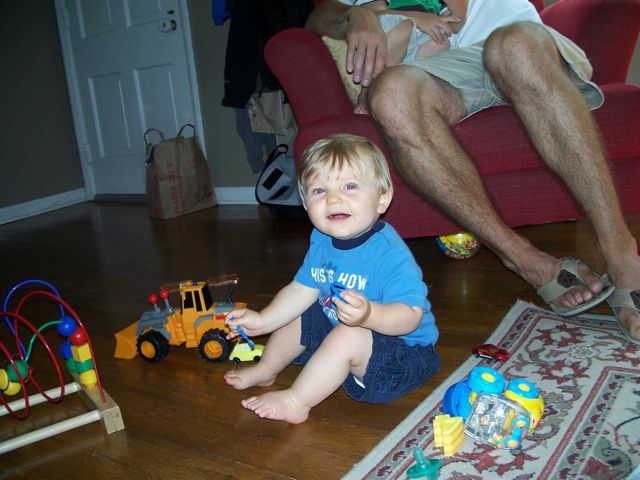 Although, life is hectic and busy, it helps that Evan will play with Carter, when I need a moment to breathe. I can't wait to see how life will continue to mold around these two precious gifts. I am truly just allowing myself the time and energy to focus on these boys. Every thing else can be put on hold, because this phase will shortly be gone and I don't want to miss a thing!